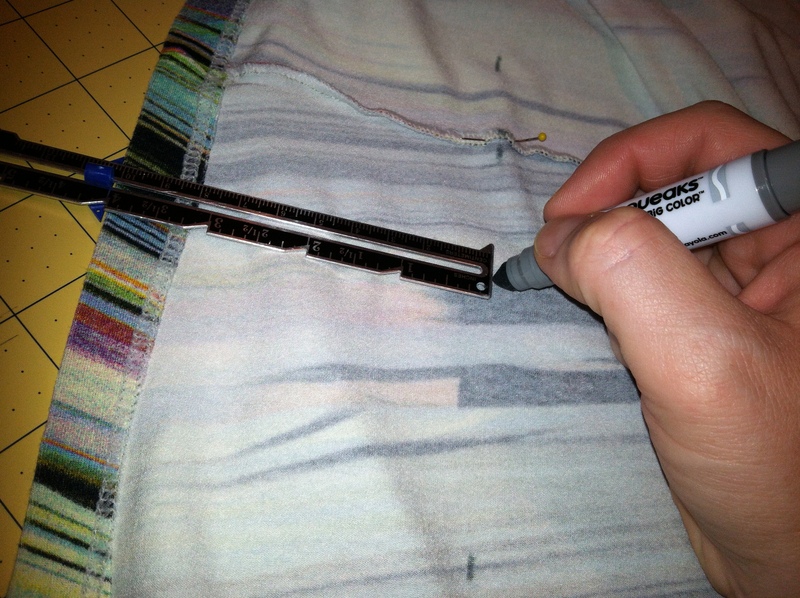 Example, set your gauge to 4 inches and measure up from the the bottom hem of the shirt. use a washable marker to mark my clothes because they truly do wash right out. try to find a color that is close to the garment color in case it would happen to bleed, but it never has before. Cut your elastic about 4 inches shorter than your actual waist. Fold your elastic in half and use your marker to draw a line at that point. Then, fold those halves in half to mark off quarter sections. This will help make sure that your elastic gathers evenly all the way around. This is a brilliant idea that I found on Wear the Canvas where she does an adorable dress re-do using elastic. Mark both the mid-point on the elastic and the mid-point on the shirt with the same color pin. I choose yellow. Then match up the other marks you made on your elastic with their corresponding checkpoints using the same color pins. You will need to stretch the elastic as you go along to get the fabric to gather. I used a straight stitch with a stitch length of 2.5. The pins hep you determine if you are stretching the elastic enough, and keep you on track so that you don’t end up short at the end. If you don’t quite match up the pins exactly, not big deal. Just stretch a little more so that the next set lines up. *Be sure to use thread in your bobbin that is similar in color to you shirt because that is the thread that will show on the front of the shirt. That’s all there is to it! I overlapped the elastic a little bit at the end to make sure that the shirt didn’t have any strange puckering where the elastic ends met. I think that it also turned out really well. A quick solution to add a little flair to a baggy shirt.